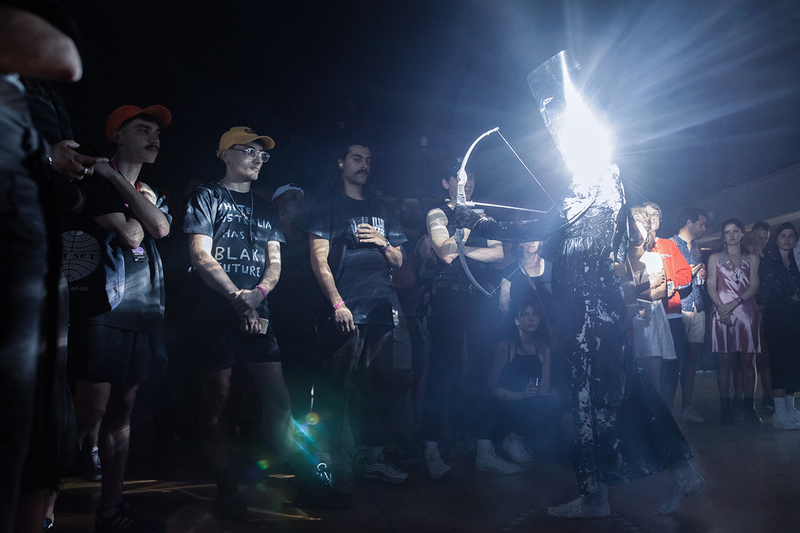 In several RealTime articles over the last few years I’ve bemoaned the lack of a Sydney-based experimental electronic music festival of scale. We have been fortunate to have Brisbane-based Lawrence English presenting Open Frame at Carriageworks ove the past two years and the large attendances illustrate that there is an audience, but there is still the issue of the right multi-room venue and, more importantly, the right promoter willing to take the risk on such a venture. Then a few months ago word got around of an ambitious all-day festival slated for Casula Powerhouse in Sydney’s South-West. 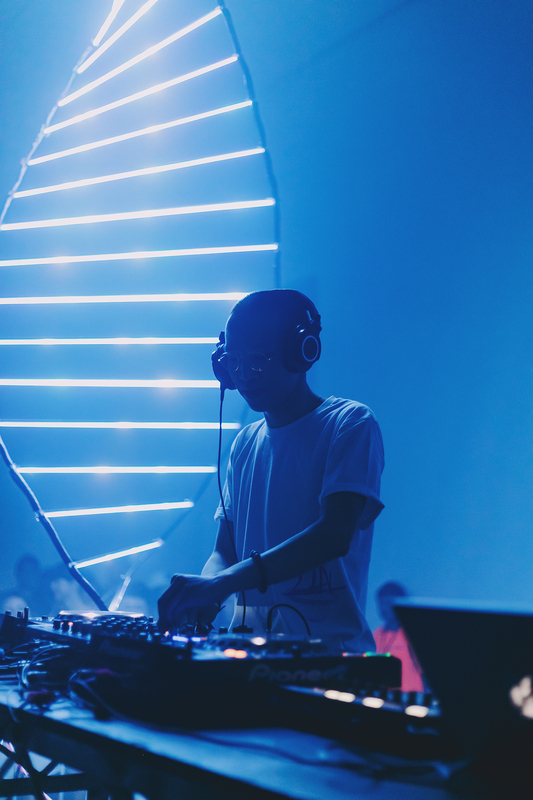 The Soft Centre producers publicised the event as taking inspiration from international activities such as Unsound, Berlin Atonal and Norbergfestival. As I haven’t haven’t had the pleasure I can’t make a comparison but I can say that Soft Centre was a vibrant festival with an impressive selection of local, interstate and international artists from various bands of the experimental spectrum, with a clear emphasis on cross-disciplinary collaboration and multi-sensory stimulation. Inhabiting the whole of Casula Powerhouse, one of Sydney’s first industrial art space conversions, Soft Centre offered two music stages. The cavernous Turbine Hall was home to the more large-scale dance-oriented acts such as Made Up Sound, Simona, Various Asses, hndsm. and Harold (beyond the scope of my review but who certainly had the crowd moving) as well as performance/music collaborations. The smaller Hopper Gallery offered the experimental, less party-focused artists, or at least it was so in the earlier stages of the day, getting progressively more beatsy as the evening progressed. The gallery adjoining the Turbine Hall was handed over to visual artist Meagan Streader. 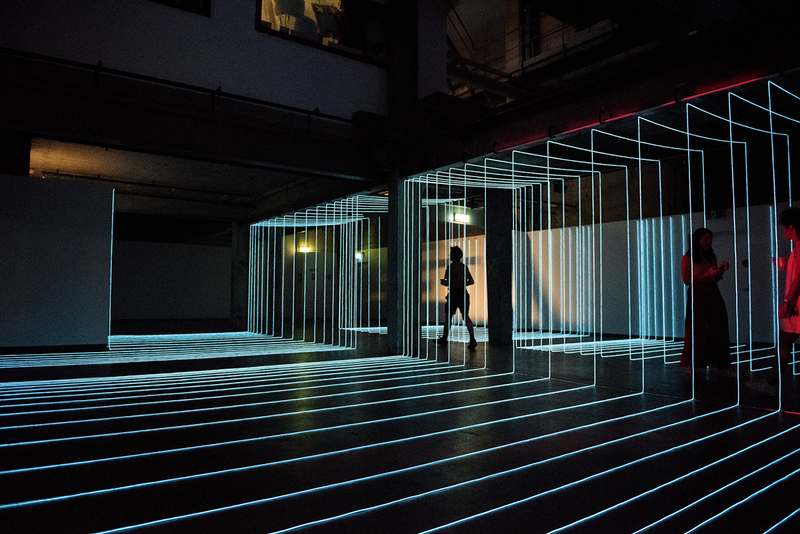 Her installation Response VI (Partition II) comprised long lengths of electroluminescent wires tracing the perpendiculars of the space to create a series of suggested rooms and corridors. It was an elegant and immersive intervention into the site, well suited to the dance party context. 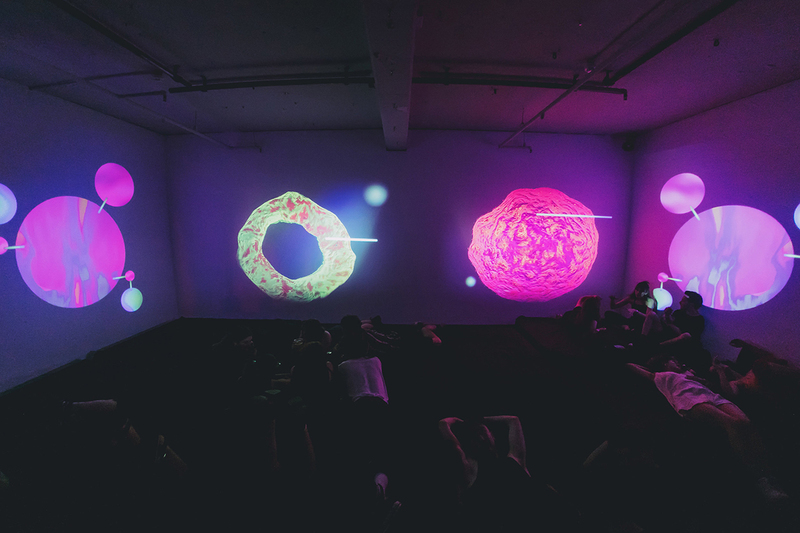 In a smaller chamber by the side of the stage was ASTERISM’s Desire//Loss, a four-screen video installation showing large glowing objects, reminiscent of both magnified cells and floating asteroids. These masses pulsated and changed colour with shifting levels of saturation, subtly interacting with the sounds floating in from the main stage. Best experienced lying on the huge bed made of Koala mattresses, this space served as a very popular chill-out room. While the Hopper Gallery was my natural habitat, I popped into the Turbine Hall occasionally to get a feel for the full flavour and scale of the event and to check out the specially commissioned performance collaborations. Catching only the second half of The House of Vnholy & waterhouse collaboration, I missed how the semi-naked body became slathered in white clay, but the subsequent performance image of the black-sheathed archeress with beams of light scattering from the tube of reflective material covering her head, was particularly powerful. The moody reverb-drenched tones of waterhouse were well-matched to the neo-gothic image-making. Hossein Ghaemi and Jannah Quill’s collaboration also made for some strong visual stimulation. 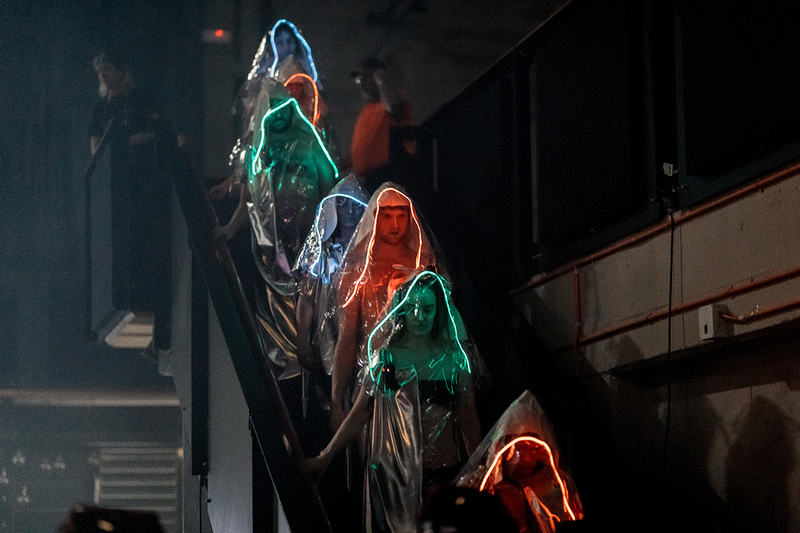 Inhabiting the floor of the space, Ghaemi’s choir wore hooded white robes with neon-light trimmings and the accompanying dancers were in bronze spangled dresses and veils. The choir’s ecstatic dronescape, and occasional flute bursts were difficult to hear in the mix with Jannah Quill’s hard-edged alterna-techno, but a certain level of ironic ritual ecstasy was unlocked. Deliberately less ecstatic was the collaboration between Melbourne’s Divide and Dissolve and Sydney’s phile. Divide and Dissolve have an unabashed political agenda attempting to “abolish white supremacy” through their wall of noise conjured up from guitar, drums and saxophone. Matched with the dark machine drones of phile, the instruments were once again slightly lost in the mix but the power of the message was certainly not, reinforced by powerful words from Divide and Dissolves Takiaya Reed. In fact, it was this commitment not just to music and partying, but to larger social issues that created the unique tone of Soft Centre. With behavioural guidelines posted around the space it was very clear that this was to be an event that strongly encouraged individualism but also insisted on mutual respect. Perhaps this next generation of producers and audiences has learned that if you want a safe space, you need to actively construct it — you can’t assume it’s going to manifest on its own. This attention to social responsibility was in every detail of the event, from the impressive ratio of non-male artists programmed (with no calling to be congratulated for it), to the gender-neutral toilets, the use of local Turkish and Egyptian vegetarian food vendors, down to the not-for-profit ticketing company, a portion of the proceeds going to Women’s Community Shelters. The producers of Soft Centre succeeded not only in presenting an impeccably organised electronic music festival that reached locals but also got people out of the inner city to Sydney’s South West, building a little temporary world where things could actually be better for everyone, if only for a little while. Read an interview with Alice Joel who commissioned Soft Centre’s music and performance art collaborations.